This grizzled soldier loves him some Madonna. Dearly beloved… we are gathered here today to get through this thing called SEGA. With this hot declaration in mind, we come to Borderline, the supposed first game released for Sega’s SG-1000. 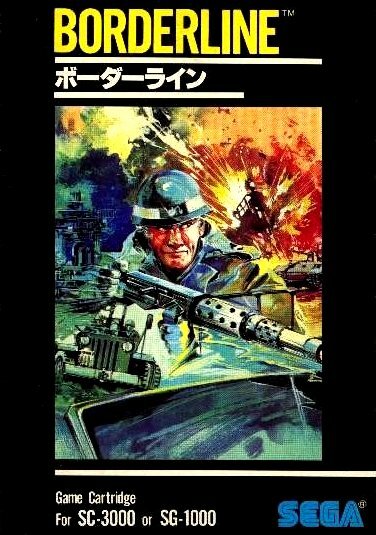 I say, ‘supposed’: Borderline doesn’t have an official release date other than ‘1983.’ It is listed, however, on Sega’s Japanese web site as the first game (G-1001) on their SG-1000 release date list, so I’m rolling with it. As one might expect from a company whose origins lie in the arcade, Borderline is a Sega arcade port, not a brand new built-for-the-console title. You control a red jeep through four stages of peace-mongering via violence and destruction. The first stage is akin to a vertically scrolling shoot-em-up: keep your jeep on the main path while destroying white missiles that launch at you from the sides of the stage. If you run into a wall or your jeep ingests a missile, you’ll be killed. Though the jeep is automatically pushed upwards by the stage’s continuous scrolling, you can move it left or right, or slow it down by pressing back on the joystick. You can also shoot the stationary missiles on the side of the stage, but only by turning your jeep fully to the left or right. The latter move requires more finesse than Borderline‘s controls can typically muster, so exercise with caution. Once you’ve defeated the procession of tanks and the atomic nuclei (representing “energy plants” and “nuclear refineries,” according to the arcade manual) at the end of the stage, Borderline changes genres. The remaining second, third, and fourth stages are stationary one-screen areas where you possess complete control of your jeep. In these areas, weave through the grass and the brick barriers, avoid the re-generating enemy tanks, and destroy the nuclei at the top of the stage. Complete all four stages and they’ll repeat on a presumably infinite loop. 80 Km? What is this witchcraft?! Differences abound between the console and arcade versions. The SG-1000 port has fewer colors than the arcade (not surprising – most SG-1000 games’ graphics look like they’ve faded after years of drying in the sun), yet is surprisingly faster than the arcade in some aspects. Your jeep and the enemy bullets move quicker, while the enemy tanks seem to move slower than the arcade. The additional speed makes the SG-1000 port considerably tougher, especially in the vertically-scrolling first stage. Sega accounted for the difficulty increase by allowing you to shoot and eliminate your enemies’ bullets; in the arcade version, enemy bullets could not be stopped at all. Your fuel gauge is much longer in the SG-1000 version, as well. In the arcade, you have to keep a continual eye on your fuel, whereas on the SG-1000, you’ll barely notice it. The arcade Borderline was built on the Sega VIC Dual arcade system, which utilized the Zilog Z80 Processor – the same CPU Sega stuffed into the SG-1000. The SG-1000 sharing hardware with the VIC Dual arcade system may explain why Sega chose Borderline – out of all their arcade games – as their debut title: it was a quick and easy port that provided little to no hassle. “Quick and easy” may have been helpful for Sega at the time, but in retrospect, they probably could have invested a little more effort in their launch line-up. Borderline, N-Sub, and Safari Hunting – VIC Dual arcade ports, all – weren’t exactly the system sellers Sega needed to make the SG-1000 stand out in a overcrowded marketplace. Consider: Famicom debuted on the same day as the SG-1000 with Donkey Kong and Donkey Kong Jr., two of the most iconic, successful arcade games of all time. Now picture yourself standing in a Japanese electronics store in July of 1983 with 15,000 yen in your pocket: what would you have chosen? Sega’s curious business decisions aside, Borderline isn’t a bad game or a bad port. It’s your standard early 80s arcade game that puts stage progression and point accumulation on nearly equal footing. As such, Borderline can come across as either addictive or shallow, depending on how much time you’re willing to invest. If you want to blaze through the game’s four stages quickly, you can do so with little trouble and fleeting enjoyment. If you want to amass a decent score, you’ll have to learn how to wield an often unwieldy, uncooperative jeep (particularly if you’re playing with the abhorrent SG-1000 joystick), but you’ll come to appreciate the game’s intricacies. Either way, Borderline is a solid, if inauspicious, start to the SG-1000 library. Wow! The graphics look EXACTLY like that of a ZX Spectrum! I suppose that makes sense…same era and all….plus the SG-1000 using the Z80 processor and all….but man…..I wasn’t expecting those bright primary color graphics! I’ve never played and SG-1000 games, but my interest in piqued now. Keep up the great stuff man! My thoughts exactly. I’ve been doing a good chunk of Speccy gaming lately (much to the chagrin of my blog) and have always been quite taken with the (what I thought was) unique look of it. My question though is, does the SG-1000 sound the same as the Spectrum? I have a fondness for those classic blips and bloops as they strongly remind me of my old Apple IIe (never had a Spectrum being in NA). Unfortunately, I have zero history with the Spectrum. My guess is that the Spectrum would have better quality sound, though, at least later on in its lifespan. Spectrum had actually even worse sound capabilities (on basic system at least) – basically a worse PC Speaker. Later models had an additional 3 channel PSG AY-3-8912 sound card. SG-1000 used SN76489, which had pretty much similar capabilities (one more channel IIRC), some (especially later) SMS games had really amazing tunes. I never played a Speccy until the age of emulation either…..but I would be most curious to know as well! Loving the writeup, really can’t wait to see your take on some of more ‘iconic’ Sega games (provided that general level of software available on SG-1000 doesn’t break your resolve first). I may have joined you a week before the end of the last quest, but after a great first review I am happy that I get to follow this one from the start! Awfully generous review for this simplistic game…. I wasn’t expecting more than a paragraph dedicated to this easily forgettable game, yet you found something interesting to write about it. Good call on the mix of Combat and Dig-Dug. Totally agree there should have been more than four stages. All I know about the Rockets are that they give ya 500 points, but they might refuel your gauge too. Glad you made the same Madonna connection that I did. It makes me feel like less of a dweeb. Liking what you’re doing here so far. Articles are a bit more in depth than some of the Questicle stuff, but I understand how that must have gotten pretty old at times. Looking forward to learning more about Sega. Like you, I was a Nintendo kid. Also, I have now followed your blog. Huzzah!